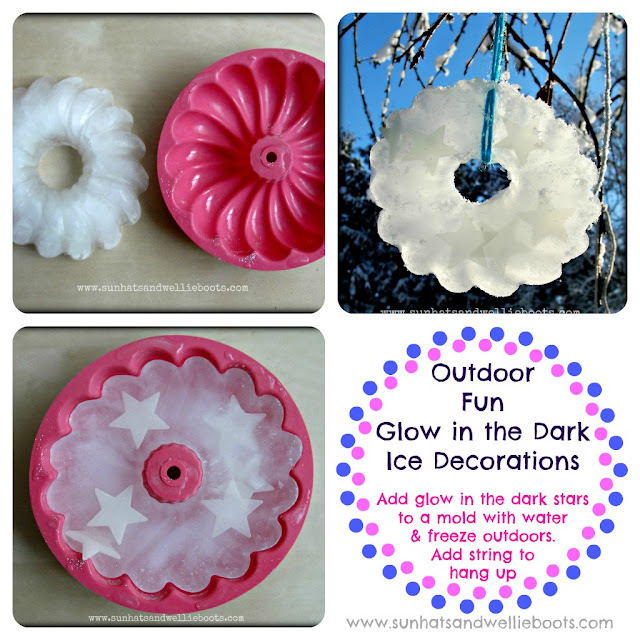 These Ice Decorations have been a big hit in our house garden! Minnie has loved creating all sorts of ice art to adorn our backyard & nearby trees. Here's just some of the fun we've had with ice art this week. 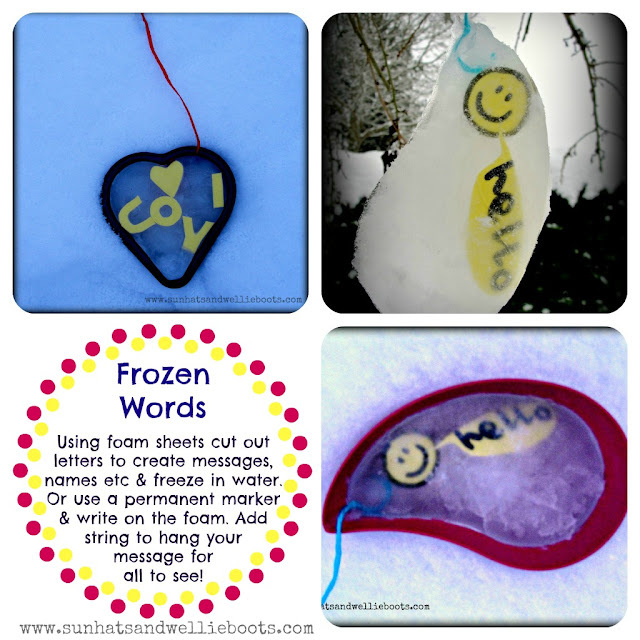 Hang them around your garden & share a smile with your neighbours. 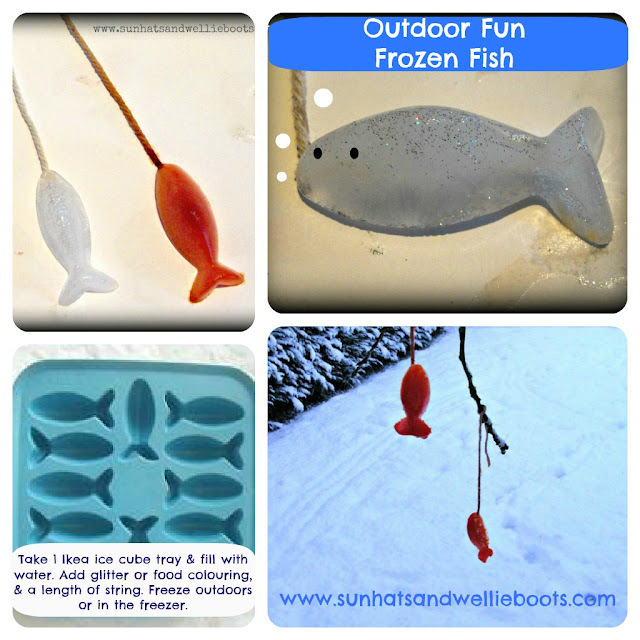 To make our frozen 'goldfish' we added a drop of orange food colouring to the water before freezing, & added glitter to the water to create our shiny silver fish. Great to observe both during the day & evening, & fun to see what happens to the stars as the ice melts. Minnie has loved exploring these frozen dinosaurs & fossils! They were so simple to make, we just added small toy dinosaurs, shells, & stones to water & froze overnight. 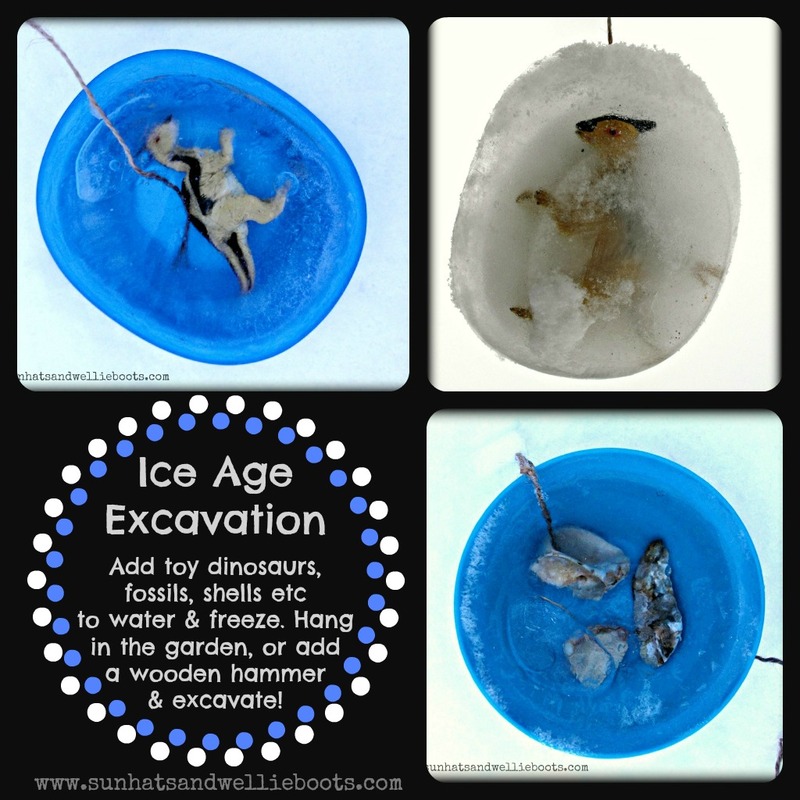 We added string to a couple of these so we could hang them on a nearby tree, & the others Minnie has explored with a wooden hammer, tapping away until the ice broke to release the dinosaur inside. As this was so popular with Minnie we froze a few more toys to discover the next day. 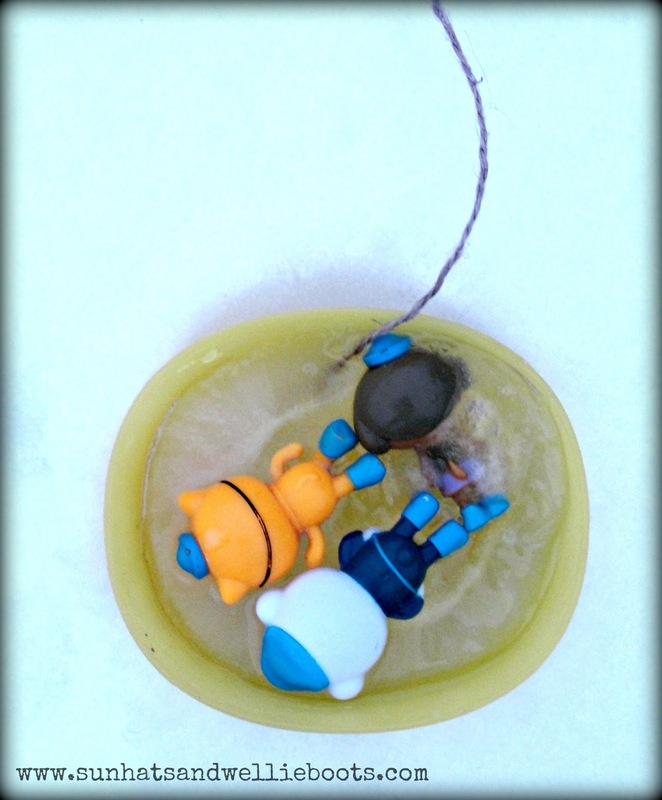 Apparently these Octonauts are on a winter mission to rescue frozen fish & gold treasure!! 'I ♥ YOU' for Daddy to discover in the morning as he headed off to work! Minnie is keen to write whenever she can, so wrote a few of her key words & family names on foam shapes using a permanent marker. She froze these outside as she had done with the others before. Her face was a picture when she discovered her writing frozen in the ice the next day! She was so excited & proud to see her writing hanging outside! Ahoy me hearties! These frozen nuggets of gold are a lucky find for any winter pirate! 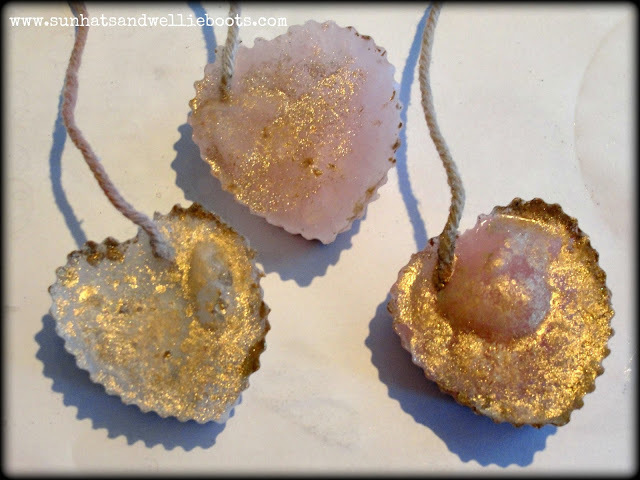 Made in the same way as before but with gold powder paint mixed into the water. Once frozen the speckled gold on the surface looks a little like gold leaf! This 'treasure' was hung around the garden waiting for our budding pirate to discover it. Add a torch to the fun, & see what they look like in the evening with the light shining on them - magic! These ice decorations are such a fun way to explore the winter season & it's weather, & can spark so much creativity, imaginative play & discovery at the same time. What could you decorate your garden with this winter?